WILLEMSTAD - In September this year it became known that the Port of Rotterdam consciously opted for a shareholding in a partnership with the Curaçao Ports Authority (CPA). The Dutch company stated that they do not want cooperation for one, two or five years, but they want a long-term process. That is why they want to confirm and consolidate their involvement by becoming a co-shareholder in the harbor. This is according to Allard Castelein, President of the Port of Rotterdam. 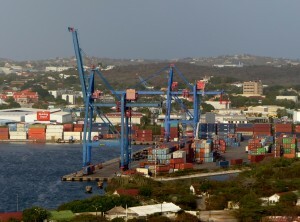 This is the reason why the Minister of Economic Development Steven Martina signed a Memorandum of Understanding (MoU) with the Development Bank Korpodeko, the General Pension Fund of Curaçao (APC), the Port of Rotterdam Authority and Curaçao Ports Authority (CPA) for the sale of CPA shares to Port of Rotterdam and the APC. According to the Minister, the purpose of the sale of the shares is 'the promotion of economic development and activity in the port and the development of various investments and projects. Those involved gave themselves the time to negotiate until 1 September 2019. Until then, the parties will commercially make their best efforts to negotiate in good faith the general terms and conditions of separate purchase and sale agreements, transfer agreements and a shareholders' agreement, or possibly another type of cooperation agreement, "according to the MoU.